A Stranger in Strangers’ Hall: What a mess! Today, for the entirety of the three and a half hours I volunteered at Strangers’ Hall, I organized craft cabinets. Why may you ask? For some odd reason, I thoroughly enjoy organizing (even though oftentimes my own room isn’t so) and when they asked me if I wanted to do this task, I sprung to it. With a cold coming on though, perhaps sorting through pipe cleaners and bits of paper wasn’t the best thing for me. My boss briefly explained where the things were located and what she wanted done. Organizing some cabinets and writing lists of supplies seemed easy and mindless enough. Boy was I wrong. Since the museum is very much involved with children’s activities, they have massive supplies of random objects. They had enough paper and pens to last them a few years and yet they had only one measly box of crayons and about 15 children’s scissors. Clearly, nobody had sorted through their craft supplies in quite some time, so I set to work. The supplies, activity guides and materials were all over the place with no sense of organization. I managed to make one cabinet only for supplies, one only for the activity sheets and the other for extra supplies such as pens, scissors, glue, etc. Even just that small task made a huge difference. Then I had to sort through everything…what a nightmare! I then moved on to make some order of the huge supply cabinet. Nothing was labeled or in any order. I’ve realized over time that most people really won’t take the time to search through boxes or things to find something, unless it is labeled for their convenience. There were the usual supplies of paper, yarn, fabric and then the unusual supplies such as baby socks, nutmeg and floor tiles. After the cabinet was labeled and organized, I thought that my tasks were done, but then I turned around. I noticed on the floor of the supply room that there were piles of random papers and objects that looked like they might have been for crafts. Guess what, I was right. Now I had a whole other pile of things to sort through that weren’t in any bins. I found more activities for the activity bins, useless scraps of paper, and other random activities that might possibly be used in the future. Once again, I sorted and organized, found places for these objects and left a pile of miscellaneous items that I had no clue about for the curator. Whew! What I thought was going to be a day of mindless work turned into a day of organizing genius. I had no idea (and I think the museum workers as well too) of the amount of craft items and activities the museum had in possession now that it was all organized and labeled. I can understand why things get like this in a place like a museum, especially after a busy holiday, but it is just incredible just how unorganized it can get. At least I’ll be leaving in a few months so I won’t have to be there to organize it when it gets cluttered up again. I think I would cry if I saw it in disrepair again so soon. Today I went to Strangers’ Hall with the notion that I was going to be helping out with some children’s project or making another “robot” out of a box. Sadly, today was completely normal. After learning about what I was supposed to help out with today, my boss and I got on the subject of my research paper. This enthused her so much that I ended up doing research for my project instead (which I am not complaining about in the least!). For the couple hours I was there we bonded over “museum talk” or the pains and joys of being involved with museums. In a mere two hours or so that I was at Strangers’ Hall, I learned its life story and why it is the way it is today. She brought out dozens of newspaper articles and photo albums of the museum in its heyday, about 30 years ago. Seeing the museum as it is today compared to what it was back then I couldn’t believe the difference. What I noticed the most through my exploration of Strangers’ Hall’s history was the massive collection the museum houses. But what I noticed even more was that about 1/18 of that is on display today. I had no idea about the amount of “stuff” the museum owned. I learned that the Hall owns about 25,000 objects and artifacts, but the majority of them are stored away. Even the objects strewn about the museum today are reproductions. With reproductions it allows a museum to become “more accessible” to the public because it makes them feel like there are less barriers around and that they can touch “historical” objects. This got me to thinking about what is better, accessibility to museums (through reproductions) or having more of the “real stuff” on display. I briefly discussed this with my boss, who told me a story about the National Trust in England. The National Trust basically protects, preserves and funds sites all around England. What the National Trust is supposedly doing now is working with certain museums to “bring down the ropes” or the barriers behind authentic items to make objects and museums more accessible and have the “real stuff”. Although that may sound like a great idea, I happen to disagree with the National Trust. In my years of working in museums, I have learned all to well that it is the adults you have to worry about more than the kids when it comes to handling objects. I’ve witnessed adults open closet doors, pick up priceless artifacts, try to go past “No Admittance” areas and even touch my personal objects. Sure there are also plenty of children that can be as bad and be reckless, but I believe adults are just as bad, or even worse. Despite those qualms, I am a fan of reproductions and authentic items and I think a museum needs a balance of both. I love reproductions because people can actually handle historical objects and understand more the lifestyle and people of the past. And I also love authentic artifacts because people do come to museums to “see the real thing” and there is so much more meaning in seeing a real, historic object compared to a reproduction of the same thing. My question to any of you reading this entry is, what do you think? Today was the re-opening of Strangers’ Hall to the public, thus meaning it would be busy today. I got placed in the Undercroft, which is where they hold all the children’s activities. Once again I was instructed to make a robot/invention sort of thing for the children to look at. That fell way to the many little visitors that soon took up all the table space. After learning about Victorian cleaning tools and techniques, the children were instructed to make some sort of cleaning invention or robot. Now with children there from ages 2-10 you can imagine the variation in things being created. I saw a total of 3 castles being made, 2 homes, 4 rubbish cleaning bins, a beauty bin and a video camera. I thought it was incredible watching the children who were given a box and a table of various papers and bits and see their imaginations at work. And I was also surprised that the children took to the craft. I must admit I was a bit skeptical about the idea of the craft, but the children had a great time and really used their imaginations. Before the children came down to make crafts, a woman from the press was at the Hall to take pictures of the conservation that was happening. Today there was no conservation happening of course because it was just re-opened to the public. So we had to put together a sort of “scene” that made it look like the museum was still conserving something. One of the volunteers was used in the pictures to demonstrate how the equipment was used. He kept nicely arguing with the photographer about how he is supposed to be properly using the equipment compared with what she wanted to make a good picture. In the end, it is always what makes a better picture than wins, not the accuracy of the scene. And I know that is how most things are with the press and the media, but it still frustrates me as a historian…I’m all about accuracy, accuracy, accuracy! I guess we’ll see what the museum has in store for me later this week! A Stranger in Strangers’ Hall: When working in museums, make robots? Yesterday I offered to come in and help out at the museum, not really knowing what I would be doing. Strangers’ Hall for the past month or so has been having a “face-lift” aka conservation work done to it, among other things, so they have been closed to the public. The day I decided to come in and help out was definitely a whirl-wind day for the museum and I was glad I could be there to help! I came into a place full of boxes, conservation equipment, paint buckets, school children, antiques, and my boss running around. This I have come to learn is normal for many museums, maybe not an everyday ritual, but definitely normal. After about an hour of running up and down stairs, following my boss around, and looking at antiques for a possible press release that was happening in about an hour, she decided it would not be the best idea to have the press come in that day. The press wanted to come in and take photos of either the conservation or the new activities planned for “half term” for the school groups. If the press came today, the museum would not have been at its most appealing, so it beat having to set up a “faux” childrens’ activities center in a half hour. Instead, my boss plopped a big box down in front of me and said, “Make a robot.” From 8 years in working in museums, I can tell you I have never heard that in any of them. Apparently, the theme for the “half term” school events is ‘Spring Cleaning’ where they will be showing kids Victorian cleaning tools and teaching them about a servant’s day. The craft they wanted the kids to make though are I guess cleaning robots or machines, making some sort of invention. My job was to create a “robot” as an example among two other ones the staff made. Someone had made a washer with legs and someone else made some sort of Hoover. Staring at this empty box, I didn’t know what to make. After a few moments of looking through craft supplies, I decided to make some sort of trash converter with a conveyor belt and a screen. The end result was a “trash converter” that turns rubbish into food. Not one of my best art creations by far, but for coming up with something on the spot, I was pretty proud of myself. This little project goes to show that anything is possible in museums. I think why I really enjoy working in museums is because there is always something exciting and different happening from day to day. Maybe it is not what most people would call, “living by the seat of their pants”, but I find it rather exciting. Now I am a bit curious to see what my next adventure at the museum has in store for me. On Wednesday I went to a volunteer meeting at the Hall, since it had been closed for a month due to repairs, etc. From volunteering at a few museums before this one, I don’t know why but I always forget that I will always be one of the youngest volunteers. This case was no exception. I was the only volunteer there under 60 (not that I am complaining in the least, I love the company of a person from age 1 to 99). While sipping on my “cuppa”, I listened to their gripes and groans about CRB or the Criminal Records Bureau. Basically the CRB is a background check that allows you (or not) to work with children in any kind of setting. They were complaining about the fact that despite getting a CRB clearance for one museum or organization, you have to get an individual one for each place you have contact with children, which is obviously a pain. Getting this clearance also limits volunteers until they get cleared, so places oftentimes have trouble organizing events because of a lack of volunteers due to the CRB clearance. Unfortunately for me, like a few of you are also experiencing, I will not be able to directly help out with children activities because of how long the CRB takes. It just seems ridiculous to me that it both takes quite a while for a person to get cleared and that you have to get cleared for each place you work at. I learned that the CRB is a fairly recent development and I hope that in future years they will improve it immensely. Another complaint I was listening to was the problems of running smaller museums through one large institution, like the Norfolk Museums and Archaeological Services. When having an organization like this, they oftentimes don’t focus on the individual needs of every museum but rather use similar regulations for all of them. Although a bit of a minor problem, the volunteers and staff were complaining about the hours the museum has to be open. Strangers’ Hall, although they are open until 4, want to have the guests out of the place by 4, thus having a final tour time. The museum takes at least 20-30 minutes to walk through its entirety (and I’d say that is rushing) so ideally it would be nice for the staffers to have everyone out by 4 and not have any stragglers coming in at 3:55 wanting a tour. Unfortunately, in order to even post a “last call” time, it has to be change by the NMAS, who regulates all the times. Sure those closing times might make sense for other smaller museums, but for Strangers’ Hall, which is a pretty large museum, it doesn’t quite work. This is obviously one of the problems of having so many smaller museums run by one larger entity. On another note, it makes me sad though that there aren’t as many younger volunteers. Obviously I know that many young kids aren’t going to be as passionate about history and museums as I, but unless we get more youth involved, it will add to (I think, among other things) more museums dying out. In every single museum I’ve worked at, there has been a majority of elders who volunteer and run the place. And they are all so passionate about it. Yes I understand that many are retired and looking for something to do on the side, but why can’t youth consider doing this too? I think with having many older people running and regulating museums, they often lose touch of what might interest younger and future generations today. I hope for the future museums can find a way of balancing these two things in order for them to survive. Parks is a topic I know all too well, considering that was what my group project was about. I thought that this blog post should be the easiest because of that fact, but actually it has been quite difficult trying to figure out what aspect of parks I should talk about. Parks, as I learned through research, are more than just aescetically pleasing. They can serve a purpose of immortalizing people and places or even as a place of national pride. What I was most interested in when I was researching parks though was the use of parks as a public space, in the sense of the public being able to use it as a place to proclaim their beliefs, where they could be ridiculed, praised or even arrested. In Hyde Park, the park I have studied more in length, seemed to have the most to do with free speech. The first example of this was with Edmund Beales and his Reform League in 1866. They protested in Hyde Park on the 23 of July, 1866 over male suffrage and the representation of the working and middle classes in England on the ballot. Fighting broke out between the Reform League and the police, and there was much consideration on banning these demonstrations. The Prime Minister at the time though soon allowed such demonstrations to continue “unchallenged…since 1872” when Speaker’s Corner was sort of informally born. 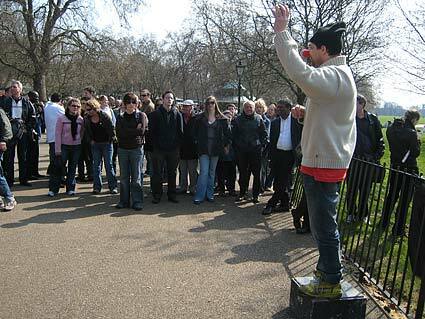 Speaker’s Corner is found on one of the far corners of the park, and today is relatively unmarked so that walking by you wouldn’t even notice it was a place of importance. Since 1872 people have basically had the “right” to speak on whatever topic they so desired on any given Sunday, so long as no profanity or violence be used. Many famous people have come here to speak such as Karl Marx, Vladimir Lenon, and George Orwell to name a few. There is really no law that states that this place is the only place of free speech here in London, but police will allow those who wish to speak their mind (granted they follow the very basic rules as mentioned previously) to do so. One of the most famous events of free speech in the park was Women’s Sunday on the 21 of June, 1908. 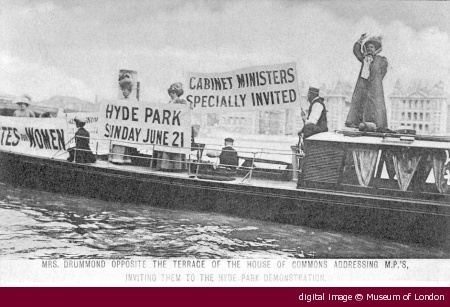 The Women’s Social and Political Union decided to hold a “meeting” at Hyde Park featuring suffragettes from all parts of the United Kingdom. They all rallied to obviously prove the point that women should be allowed the right to vote. It attracted a crowd of at least 300,000 people and it was one of the largest single demonstration of that time. Women were advised to “wear the colours” which were white for purity, green for hope, and purple for dignity. Although the demonstration was successful in proving its point, it ended in many women’s arrest. It is strange to think of the limits on free speech, coming from a country where it is allowed (within reason). The importance of these green spaces to the history and heritage of London and England as a whole can be seen through such events of free speech and demonstrations. These places hold a sense of national pride to England’s history, and I am glad that people are still allowed to get up on their “soapboxes” today and speak on whatever they so believe in. That is the beauty and power of history. A few days ago, Sarah and I finally decided to finally visit the John Soane Museum. Although I had been hearing quite a bit from people about the museum, it is definitely something to be experienced! The museum is a pack-rat’s dream, with each room crowded with so many artifacts and architectural pieces that it is hard to not accidentally graze something with your arm. Even so, the museum was quite sufficient at trying to display as much as they could, for clearly Soane liked to collect a lot of his favorite things. One of the first things I noticed, being a museum person, was the general upkeep of the museum. About 3/4 of the objects I felt were free to wear and tear from not being under some sort of protection. The house, although it was, I felt, quite large for a home museum in London still could not sufficiently display all of the objects, and I am sure there are even more in storage. My questions were somewhat answered with a visit to the third floor. On the third floor, it displayed an elaborate plan for future renovations and improvements on the museum. Many of the designs were to expand on the structure and create better ways to display the many, many objects in the museum. As I looked at these displays, I wondered how many of these historic buildings, like the Soane, receive funding. I know in America we have the National Trust for Historic Preservation that funds the upkeep of many a historic site. In London though, I had noticed many museums, historic and art based, being funded by the National Lottery. I know for me, since I live in Pennsylvania, our lottery “benefits older Pennsylvanians”. The National Lottery here in England though, has an outlet called Good Causes where the money goes towards charitable causes, education, sports, the arts and heritage. For each the art and heritage causes, the Lottery distributed 16.67% of their funds. This was interesting to me because do I rarely see, at least in Pennsylvania, the lottery going towards museums. The National Lottery here in England has benefited museums and art galleries in past decade or so, through increased funding and allowing many of these places to administer free admission. Through both of these benefits of the National Lottery, museums and galleries have seen their attendances increase dramatically. An article called, Museums: after the Lottery boom showed that for example, at the V&A, it “saw attendances increase from 75,773 in November 2000 to 132,882 in November 2001.” This is incredible. From working and volunteering in many museums back at home, I know how many struggle with just attendance, let alone funding. Now back to the John Soane Museum. Through the Heritage Lottery Fund program, the museum was awarded in 2007 a grant for improvements on the site. They were awarded £28,900 for project planning, education, exhibits, and conservation of the museum. The Soane Museum then waited to submit an application for a grant of £3.3 million for their Opening up the Soane project in March 2008. It has since become a £6 million project to “restore, refirbish, and improve” the Sir John Soane Museum. The main drive for these projects, besides creating a new and improved space, is allowing the museum to be more easily accessable to the disabled, and this is why they can receive much of their funding by claiming as such. According to the Soane Foundation’s website, this is all to be completed in 2012 (along with many other projects in London) for the 200th anniversary of the building at its site. The National Lottery Good Causes foundation seems to benefit many local and national organizations, museums and galleries included. It has allowed for attendance to be increased through free admission at sites where that is a feat in itself. It has allowed for museums to receiving funding to make the improvements necessary for future generations to learn from and preserve it for them. At first I was skeptical of these places being funded by the National Lottery, but its benefits for all areas of local and national heritage, art and history cannot be beaten. I think this would be a great thing for America to adopt because I have seen one too many museums close in my area from lack of funding, attendance, and support. Mostly people go to pubs because of a certain atmosphere, good service, good ale, etc. But why I really like pubs is because of their diverse, and often strange, names. Within walking distance of the hotel we have a few pubs with names such as The Court, The Brick Layer and Marlborough Arms. Stopping at the Brick Layer’s Arms pub the other day got me wondering about pub names in general. After reading an article from the London Times it gave me more insight into the meaning of these names. More than just leaving you to question if these places serve bodily parts, these names tell about the history involved with the place. The Times listed the five most used pub names as of 2007 which were: The Red Lion (759); The Royal Oak (626); The White Hart (427); The Rose and Crown (326) and The King’s Head (310). After reading further into my post, you’ll learn probably why a few of these names are so common. Some pub names are sometimes easy to figure out, for they often have religious, political, heraldic, personal, occupational or sporting names. A religious sign might have objects such as a lamb and flag (representing Christ and the Christian flag). Many decided to show allegiance to the monarchy and have names such as The King’s Head (or Arms) or The Crown. Nearby to the hotel, The Brick Layer’s Arms pub was probably named such because of the trade that went on in that area. Also close by there is a pub named The Marquis of Granby, which I learned with a quick search that many pubs were named after this man. Apparently John Manners, the Marquis of Granby, was a general in the 18th century who looked out for the welfare of men upon their retirement and established funds for the creation of taverns, thus why many are named after him. remarks that this practice originated in Roman times where they would hang vine leaves outside to distinguish the place as a tavern. Pubs are not just a place to eat or drink, they each tell a story about the history of England and their location. They can also tell about the politics or the status of the place and the owner. So the next time that you decided to go drinking or dining at a local pub, perhaps take a moment and consider about the meaning behind the sign. Perhaps after you figure out its past (potentially dark) and you may decided you might not want to stop there for a drink!